A local parent spotted a "slow and lethargic" raccoon near P.S. 24 on Thursday afternoon. She wasn't sure who to call, and the short answer is to call 311 if you see any animal behaving strangely. 311 (Animal Control) is probably the best resource in the City for issues like this, but they're unlikely to be able to do anything if the raccoon isn't contained (in a box or a cage trap) or injured. Even slow moving raccoons will probably leave the area before they arrive. Believe it or not, raccoons are actually more populous in cities and suburbs than in the "wilds," because they thrive on our leftovers and trash. The Humane Society of the United States has lots of good information on its website about raccoons: Link. Another good resource is the MSPCA: link. I have seen raccoons near the 9th Avenue D/M train station numerous times. I tried to take pictures of them but never had a good camera when I encounter them. Back when the car sales lot near the station wasn't as clean as it is now I had seen 2 adults feeding off leftovers and cat food and water left for abandoned cats. 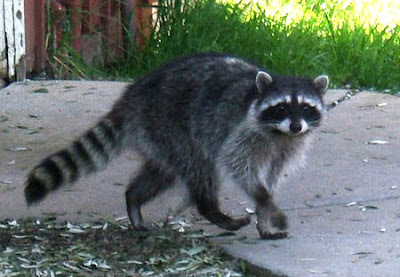 One time a young raccon ran toward me and I tempted to kick it not knowing if it was going to attack me. Instead, I stood still and it ran passed me. Now that the area is cleaner and less trash I haven't seen them for almost 6 months. Came across this from today's NY Daily News while having my late dinner salad at the 39th St. Diner and remembered seeing your posting. Pretty scary since the sighting you covered was near P.S. 24. Raccoons (and opossums, by the way) have lived at Green-Wood Cemetery and the Bus Depot grounds forever. Remember, they (the critters) were here before we were, and while we need to be vigilant and protect our children, I hope we also protect our natural environment, including its four-legged inhabitants. Fewer than 30 cases of Raccoon Ringworm have been reported nationwide. A rare, deadly disease that has left an infant brain damaged and a teenager blind in one eye, has been detected in Brooklyn, the Daily News has learned. The city's Department of Health is on alert for Raccoon Roundworm, a disease contracted through contact with raccoon feces. It can cause permanent nerve damage and death. The disease had previously been incorrectly called Raccoon Ringworm. "Parents should closely supervise small children in areas where raccoons live to prevent possible ingestion of raccoon feces," said Sally Slavinski, of a Health Department unit that deals with diseases that can be transmitted between animals and humans. In the first case, a healthy infant who traveled to upstate New York last year started having seizures and spinal problems last October. The baby has been brain-damaged and hospitalized ever since. Then, in January, a Brooklyn teen who hasn't left the city recently, lost sight in the right eye. Fewer than 30 cases of Raccoon Roundworm have been reported nationwide. It takes two to four weeks for symptoms, which include nausea, loss of coordination and muscle control, and blindness, to develop. News of the disease, which strikes mostly kids and especially developmentally disabled children, sent shivers through city playgrounds. "It's terrifying. God only knows how I would react if my kids became that ill," said Bay Ridge mom of two, Angelia Kane, 38. "The concern for me would be kids being kids. I have a 3-year-old girl and a 6-year-old boy. When they're slightly out of sight, they're going to pick up something in the course of their normal behavior and put their filthy hands in their mouths." With the swine flu outbreak, Kane's kids have been washing their hands more often, but she said she won't keep them from going to the playground. "If you spend enough time reading about all the things kids can contract you don't leave the house," she said. Still, Slavinski said parents should take other precautions. "Raccoon feces should be removed using gloves and disposable bags, and placed in trash to keep from children," she said. A very large raccoon is now asleep on my third story roof deck. Been there curled up for 8 hours. called the city- no good.